Author chat gets a makeover! In one of his last projects before he leaves us (goodbye! ), Luke gave author chats a facelift. 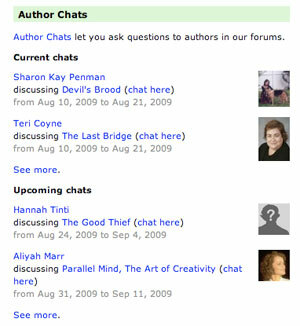 Previously, you could only find out about author chats (current and upcoming) by going to the Author chat group. We now have a module for the homepage, which shows current and upcoming chats (you can customize how many you want to view at once). You’ll also see links to current, past, and future chats on all the relevant author and book pages. Saw that earlier today and like it … more likely to see an upcoming chat and contribute. I've noticed some Author Chats are not well attended, this will certainly increase my chances of joining. I'm glad the information about author chats is finally on the home page. I hope that attracts more author chat participation. I'd like to suggest that the authors who are scheduled to be doing chats get their pictures up on LT ASAP. Those "question mark pictures" are really not very attractive. Sorry to hear that Luke is leaving LT. I've enjoyed the contributions he's made here at LT (particularly the widget contest after he did the code for those).